Find a cozy, romantic, winter getaway. Michigan winter getaways can be the romantic cure for the couple with cabin fever. You don't need to be a skier or snowboarder to enjoy winter along the lake. The beachtowns are just as enchanting and there is plenty to enjoy during this snowy time of year. Imagine the two of you walking in a falling snow along the streets of a sleepy little Michigan beachtown. Browsing the small shops and stopping for a cup of coffee while watching the snow gently coming down. You can start to see how romantic a weekend getaway during winter can be. 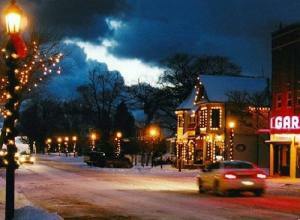 Christmas can be a magical time for a Michigan romantic getaway. 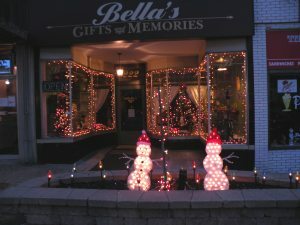 The towns and villages are all dressed up for the season. This is a good time to load up on Michigan made products. Sue and I believe in supporting local, independent business's. All the places to stay proudly showing off their holiday spirit. Easy to understand how this is one of the most romantic times of the year. The big resorts and hotels are nice, but again, we really enjoy the older inns and bed and breakfasts this time of year. The atmosphere is slower, less hurried. An atmosphere that inpires relaxation and of course ... romance. This is a great time to consider a cabin, cottage or rental home for extended romantic getaways. You should find cheaper "off season" rates. The inns and bed and breakfasts usually have roaring fires in their fireplaces. It all really makes being "snowed in" a pleasure. A time for the two of you to wrap yourselves in the warmth of each other and enjoy your relationship as it was meant to be. 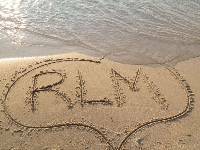 We all need it ... and winter is the perfect time for a romantic getaway.